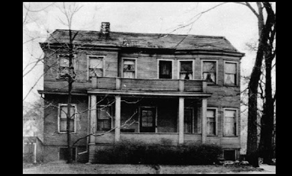 Even before her new religious community was formed, when she arrived in Peoria on October 28, 1876, Sister M. Frances Krasse made a promise. "Lord, we will never turn away any whom you send to us for care." As she and her Sisters stood at the altar of St. Joseph Church in Peoria, Illinois, the foundation was set, and more than a century later the promise remains intact. Today the Ministry of OSF HealthCare continues to serve patients their families and communities across Illinois and Michigan. Sister M. Frances Krasse and her small group of sisters traveled to Peoria at the request of Reverend Bernard Bach, who recognized a great need to serve the poor, the sick, the aged and the dying. The Sisters came from Iowa City having migrated to America from Germany, where government suppression had threatened the very existence of their religious community. 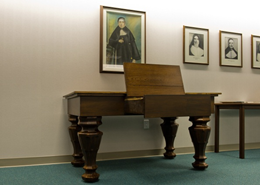 With their kindred spirits, a profound sense of faith and the deepest of beliefs that the God who called them to Peoria would provide their every need, The Sisters converted a small house on South Adams Street into Saint Francis Hospital. "Dear Sisters, keep yourselves in strict accord with the rules & statutes. Live in meekness & obedience. Nurse the sick with the Greatest Care & Love, then will God's blessing be with you." Mother Frances Krasse's personal example teaches us to be joyful and to have grateful hearts, even in the midst of suffering. Her words live on as the heart of the OSF HealthCare Mission. The visual icon of this storied desk, used by Mother Frances Krasse many times over as she penned her thoughts, beliefs and inspiration, symbolizes her Legacy. It reminds us of the many times Mother Frances Krasse must have sat in solitude and with great reverence for her God, translating His calling into words of inspiration for her Sisters. Today we continue her Legacy. We serve with the greatest care and love, reminding ourselves the God who called us to work in this Ministry, will always, always provide! We invite you to join us. A gift from the heart, given freely with the greatest care and love, binds us all in the rich tradition and history that started so many years ago with one simple promise, one Legacy of Hope.